One of the main reasons to build a castle is because you like the way castles look, obviously. Otherwise you wouldn’t take on such an ambitious building project. One of the key components to how they look is the exterior stone cladding for your walls, and that can also be a significant budget expense. I’m looking at about 30,000 sq/ft of stone wall on the exterior, and another 5,000 sq/ft on the interior. That sort of high volume means you can negotiate discounts, but it also means every additional dollar you spend per square foot really adds up quickly. There are five main options you can use to clad your castle. Stucco, brick, manufactured stone veneer, real stone veneer, or full thickness stone. I’ve ranked them I believe in order from cheapest to most expensive. Brick castles are not really common, and included in brick would also be brick veneer. But it was used as a building material and you may be happy with it and able to pull it off. Lots of gothic revival castle like structures from the early 1900s were done with brick, and you might be able to find some really old true European castles that used it as well (quarries were not always conveniently located). Brick is fairly cheap, and brick masons are cheaper than stone masons so you save on install. You can do full thickness brick where a brick wall is essentially built just outside your building’s structural wall, or brick veneer where thin brick is adhered to your building’s structural wall. Manufactured stone is essentially brick, built the same way, but made to look like stone. It is usually only sold as veneer you apply to your wall. From a distance it looks really good, but up close you can usually tell it isn’t real stone. It is usually more complex to install, needing more labor than regular brick, but it is cheaper to install than real stone because it is much lighter and easier to handle. Weight also matters for the freight costs of getting it to your build site. Both brick and manufactured stone last darn near forever, mortar can fail but brick tends to keep on chugging along. Thin veneer stone is where they take real stone, and saw it to be an inch thick or less, and then it is adhered to your wall. It is much cheaper and easier to install than full thickness stone, but more expensive than manufactured stone veneer. It isn’t available, or availability competitively priced, everywhere in the country, as it relies on a good supply of local stone. Full thickness stone is usually 3+ inches thick and is built like full thickness brick. A second wall is built outside your structural wall with stone. This stone is by far the most expensive option, it is expensive, heavy, takes a long time to install, and requires the most specialized labor. The freight can be killed if the quarry isn’t close to your build site. Stone of course, also lasts forever. For my project I explored the last three options. I had bids on full thickness stone of about a million dollars, ~$30 sq/ft installed. This was not affordable in the least. Thin veneer stone I was able to get for less, around $12 sq/ft installed, and I would have gone with it, except I really need to hit my budget numbers and need to find savings where I can. Because of volume I was able to negotiate manufactured stone veneer down to $9.5 sq/ft installed, which saves me almost $100,000 over thin veneer stone at the volume of 35,000 sq/ft. 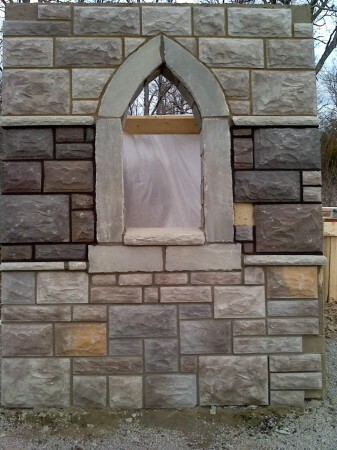 My stone mason did a mockup for me, overall I want a dark grey stone with light trim accents, so in the below mockup I choose the middle dark stone color. For the actual trim, like for window trim etc. There are also a variety of options. You can use standard aluminum brickmold style window trim, precast stone trim (a very fine concrete essentially), architectural foam trim (foam coated with a stucco like product made to look like precast), or cut stone. Turns out my mason figured the cheapest way would be to just buy flagstone (about $1 sq/ft) and cut it as needed. It’ll look a little more rustic than precast would, but I like rustic. We haven’t quite figured out what to do for corbels and some of the other exterior architectural details yet. Great update! Considering the savings of around $700,000 using the manufactured stone veneer versus using full thickness stone, I can clearly understand the decision. I’m fairly impressed with the appearance of the veneer though. Should look great. 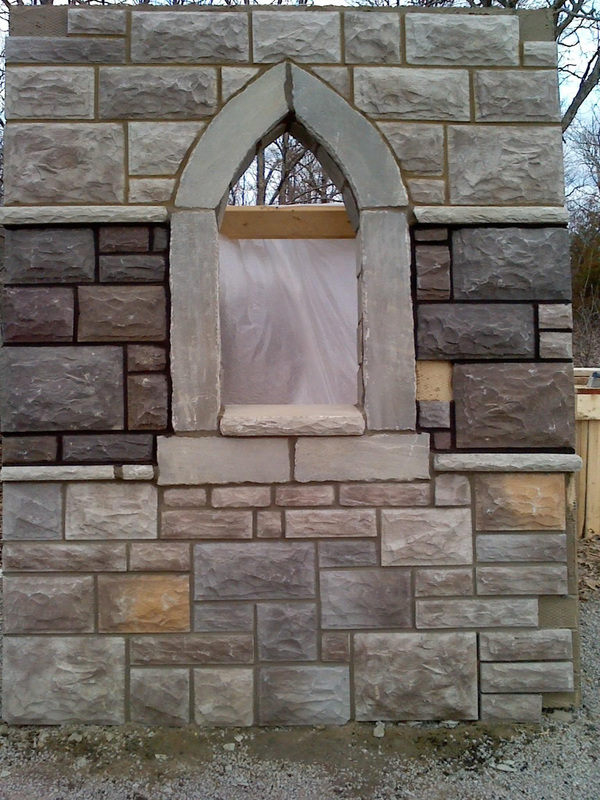 The stone color would be a tough choice since it has a huge impact on the appearance of the castle at the end of the day. I’m glad you did not include concrete block as an option, since I’ve seen some people online go that route to save cost, but it ends up looking awful. Seriously grateful for the updates since, as mentioned before, very similar interests / styles. Best of luck! What’s the schedule look like at this point? Ya concrete block really isn’t good as a finish on anything other than a commercial building, though I can understand when on a really low budget building something like this it might be your only choice. It is also pretty weak, you regularly see footage of CMU block buildings being destroyed by tornadoes, monolithic poured concrete structural walls are definitely the way to go. Right now we’re looking to start excavating soon as we can get the permits done, and we still need some bids finalized, some plans were redrawn to use a different (cheaper) steel floor system, and so some things have had to be rebid. Then we also still need to finalize the mechanical, electrical, & hvac bids, then get the loan, and start construction. I’m hoping maybe we’ll close the loan in May at this point if things start coming together faster. So I don’t feel like I’m spinning my wheels I can pay for excavation out of pocket prior to that though. If you have the opportunity to come to the Northeast, you might be well served to visit Yale’s campus. The majority of their buildings are of a gothic style architecture all in stone varying from Euro style mannor houses to some that look people refer to as castles with their big wooden doors and portcullis and entry ways that lead to court yards completely concealed on all four sides. Loving the story, and I really appreciate what you’re going for here. I’m curious about the manufactured stone veneer, and how it becomes the curved surfaces in your 3D render? I’ve only seen flat sheets of stone veneer. Great job man! I live in Brazil and I would like to congratulate you for your castle and for your site “buildingmycastle.com” I like too much medieval constructions mainly old castles and I hope to built my in 2018. Thanks a lot for this informations and for the photos! Hello, I know that my comment will not please you. I’ve seen and visited hundreds of old castles, houses and walls in Europe. They are almost all made of stone but never look like your mockup. These false stones only have the colour of stones, but they don’t have their appearance (size, shape…). These faux stones are too artificial. Old walls made with true stones are usually made with almost rectangular stones that have roughly the same size, the stones are roughly aligned and the stones are cut so that the wall is smooth or cheaper constructions are made with more small and irregular stones and more cement and plaster. I know that true stones are much more expensive, but at least with bricks it wouls have been more realistic (example : château de Saint-Fargeau). Stones or bricks doesn’t necessarily have a good longevity, it depends on their quality and whether they are adapted to the climate. If you wanted to build this house in Europe it would probably not be considered as beautiful, just like many other modern “castles”, because it doesn’t look like a castle excepted for the towers and a few details. Just so you know here in Europe full thickness stone can also mean walls entirely in stone, not only a few inches of stone outside a wall in concrete. If you haven’t heard form the “Château de Guédelon” yet, you should, because it is probably the only true castle that is currently under construction. You didn’t offend me Non, as I said, real stone is definitely the way to go if you can afford it. We’ve actually managed to negotiate on the real stone, and while it is still up in the air, right now it is only about a $1 per sq/ft difference for real vs fake, so if that holds true we’ll probably be going with real stone. We built our castle with Insulated Concrete Forms covered with stucco. You can see pictures by checking Keens Castle. I plan to build towers and walls with cement blocks covered with real stone. I read about a gravel wall system at the site below when researching bulletproof walls. According to this gentleman’s research you can use 1/2 inch packed gravel within the outer walls of a framed home to bulletproof your home. The gravel walls can take a hit with no degradation, even from high velocity 7.62 military rounds, by causing the bullet to ricochet and change directions, forcing it to lose its shape and so that it does not have good penetration capability and gets quickly chewed up. I added this because I was thinking of why people don’t make castles anymore and I read that stone castles remained important until the effective use of gunpowder in the 15th century made them easy to demolish. So I think if you wanted to make a modern day castle you would want something like gravel walls. Hi Ishmael, I just came upon your site as I was researching castles for a project that I am considering. First let me applaud you for your undertaking, as it will be quite an undertaking to say the least! My background is a mason contractor for 35 years here in New England and I started in the quarries of Cape Ann in Rockport Ma where we would cut granite into all various sizes and shapes and install it. I have worked on various large scale projects, buildings,universities, residential homes with stone, brick,block, thin veneer, manufactured stone veneer, stucco. I have to agree with Non about your choice, I have done large square footage jobs with this manufactured stone and when you step back and look…it is too perfect…pretty funny thing to say, as a tradesman, you always strive to do the perfect job but this type stone is to perfect and ends up looking fake, in my opinion, needs to have more irregularities to it. If at all possible go with the real stone (real easy for me to spend your money !) in any case I wish you the best in which ever way you decide to go. You have my email feel free to contact me if you wish … I look forward to watching your project ! I am building a castle wedding / reception hall in Texas. I have a stone business and was wondering where you got your plans? This site is awesome and your castle looks really nice despite some negative opinions. I first designed the place myself, then I paid an architect a lot of money to go through my designs and turn it into a legal building.